A Greater Swiss Mountain Dog is relatively easy to shape up well. Of course, during the training we have to keep in mind the strong personality of our friend, and respond to it consequently and with determination, but generally the training is much more easier than the training of German great Dane or other mountain dog of similar size. He likes learning and he will do everything to please and not to disappoint his master. Even as a very young dog he is very clever and he will never forget what he has learnt. A well – mannered Greater Swiss Mountain Dog is the best companion we can imagine or dream about: wise, obedient, faithful, never demonstrating whims nor nervousness. A Greater Swiss Mountain Dog is calm but not languid, and with delight performs the given tasks. You should use this feature and give him various tasks: to fetch, to track or to look for objects. And do not forget to reward and praise him! This bosom dog thinks highly of deserved praises. A Greater Swiss Mountain Dog arouses respect by his figure, and his courage predisposes him perfectly to the function of a brave supervising dog. He stays by the gate with vigilance, and let nobody go inside. What is more, he does not display any aggressive behaviour – this impressive animal has a gift for sense of danger and he is always ready to guard the health and life of the people he has loved. Towards an intruder he decidedly shows fangs, and growls with warning – but usually does not bite, because there is rather no need. When the situation returns to normality, he calms down quickly. Also the neighbours will not have reason to complain about the Greater Swiss Mountain Dog, because it is not the dog which barks for no reason. 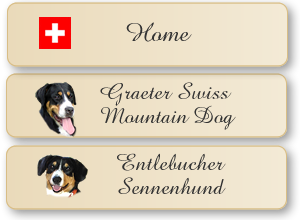 The Greater Swiss Mountain Dogs thanks to their calm and friendly character are prized first of all as great family dogs. This strong dog shows only gentleness and warmth, his unconditional faithfulness, big vigilance, and one hundred per cent devotion to his master are one of the most sought – after features of domestic dogs. The Greater Swiss Mountain Dog will prove everyday his attachment and love to us. These dogs are famous for a huge heart and love for every member of the family, from the youngest urchin to the very busy adults, who usually have not got much time for their dog. The dog will be the happiest when the whole family gather altogether. Then he delights in their company. Thanks to his perfect memory the dog will know both all the names of the family members and the environment. All the sheep dogs are regarded as perfect guards for toddlers, and a Greater Swiss Mountain Dog is not an exception here. Even dogs – male show incredibly lot of gentleness and patience in contacts with children. And they are really happy when carrying the pram. But from the beginning children should be taught how to treat the dog in a proper way.